Lightning flash – Electrifying dazzling display of light Lightning is an amazing and breathtaking sight to witness. At the same time it is one of the most dangerous and unpredictable of all natural phenomena. But how much do you really know about lightning? Let’s look through some facts about lightning. Lightning is a not only one of the most beautiful displays in nature but also one of the most deadly natural phenomena known to us. Lightning is a flash of light in the sky, occurring during a thunderstorm and caused by a discharge of electricity, either between clouds or between a cloud and the earth. Lightning flashes produce 100 million volts of static electricity! Water and ice particles inside thunder clouds collide and become charged with static electricity. Smaller positively charged particles move to the top of the cloud, while heavier ones with a negative charge collect at the bottom making the upper portion of the cloud positive and the lower portion negative. Thus the cloud may acquire the extreme charge separation that is required for a lightning strike. When there is a charge separation in a cloud, there is also an electric field that is associated with the separation. Like the cloud, this field is negative in the lower region and positive in the upper region. Cloud-to-air lightning This form of lightning happens with a build up of one type of charge, usually a positive change that comes from the top of a thunderstorm. This positive charge releases to an area of opposite charge that is somewhere in the atmosphere around the storm. The strength or intensity of the electric field is directly related to the amount of charge build&dash;up in the cloud. As the electric field becomes more and more intense – the electrons at the earth&apos;s surface are repelled deeper into the earth by the strong negative charge at the lower portion of the cloud. This repulsion of electrons causes the earth&apos;s surface to acquire a strong positive charge. All that is needed now is a conductive path for the negative cloud bottom to contact the positive earth surface. The strong electric field, being somewhat self–sufficient, creates this path. The strong electric field causes the air around the cloud to “break down ” allowing current to flow in an attempt to neutralize the charge separation. Thus the negative charge from the base of the cloud induces a positive charge on the ground beneath and discharges as lightning. Only 20% of the lightening is observed as the ones that occur between the cloud and the ground. Usually lightning strokes heat the air up to 30,000 °C and make the air (dielectric) to break down to allow the current (the flow of charges) to pass through it. While the current flows through the air, it makes a huge sound called the thunder with shock waves passing outwards. Cloud-to-ground lightning Cloud-to-ground lightning is a lightning discharge between a thundercloud and the ground. It is usually negative in polarity. In general, the lightning between the cloud-to-ground begins with in a cloud. The localized electric potential gradient causes a discharge of electrons to move towards the bottom of the cloud and from there to the ground. In actual terms this type of discharge is very fast and occurs in a series of steps that pause for about 50 million times of a second and hence can&apos;t be visualized with naked eye. Normally, the build up of the charges on the ground occur on the tallest buildings or trees on a open ground, etc., that are reachable for the cloud&apos;s negative charge. Hence the difference in charge causes an electric potential to build up. The dry air (insulator) present in the atmosphere will not allow the charge flow to pass through it. But the electric potential generated between the clouds and the ground would be so intense (millions of volts per meter) which could eventually overpower the insulating dielectric properties of air. A technology capable of harvesting lightning energy would need to be able to rapidly capture the high power involved in a lightning bolt. There have been several attempts to investigate the possibility of harvesting energy from lightning. What is a Lightning farm? It is said that the a single thunder eventually has the capacity to power up a huge city like Washington DC for 30 days with out any interruption. That&apos;s how the idea to store this power has emerged and led to the build of lightning farms which could store the power of a thunder. This is the one of the most awaited areas of research where technology must assist science in achieving the goal to power up a huge city with a thunder. It has been studied that each bolt would charge up to 5000V in 1.2 micro seconds. A plenty of such bolts installed on a open ground would eventually give a large amount of power to electrify a small city. Intra cloud lightning occurs when there are both positive and negative charges within the same cloud. Usually, the process takes place within the cloud and looks like a bright flash of light which flickers. This is by enlarge the most common type of lightning that happens entirely inside the same cloud between the oppositely charged regions. It can be visualized as the jumping of charges inside the clouds. The flash usually occurs between the positively charged regions at the top of the cloud and negatively charged regions at the bottom of the cloud. Generally this type of lightning is hard to see as it occurs inside the thick clouds. The lightning of this type will be observed when the flash occurs almost at the boundary of the cloud. Cloud-to-ground lightning Inter-cloud lightning is less common. Lightning strike occurs when there are positive and negative charges within different clouds and the strike travels in the air between them. It is also known as cloud-to-cloud. 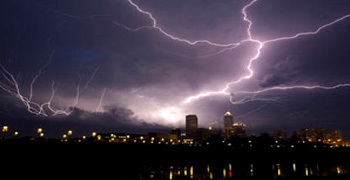 This type of lightening is most similar to intra cloud lightening but with a minor difference that it occurs between two or more different set of clouds. The discharge of the charged particles is not through the cloud but through the air. 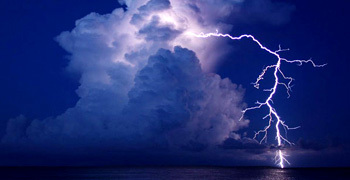 Cloud-to-ground lightning is the most dangerous type of lightening especially for human beings. 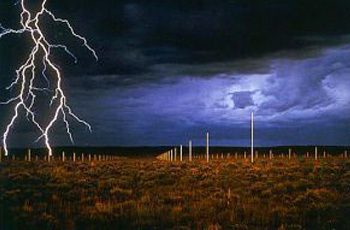 This type of lightning starts at he bottom of the cloud and ends at any pointed surface of certain height on the ground. Usually lightening delivers negative charge to the ground. The negative charge builds up on the bottom of the cloud which searches for a sharp pointed tip at a certain height on the ground which posses opposite positive charges. Thereby lightning occurs by dissipating all the negative charges to the ground. This type of lightning or electrical discharge occurs between the thunder cloud and atmosphere. It occurs between the cloud and an area of opposite charge in the surrounding atmosphere. It is not as harmful as the cloud-to-ground lightning. Anvil Lightning Anvil lightning is a type of lightning referred to as "the bolt from the blue" because it often appears suddenly from a seemingly cloudless sky. 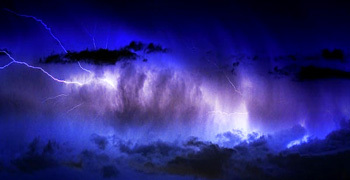 It is often called a 'bolt from the blue' because it occurs in seemingly cloudless skies — a cloud-to-ground discharge reaching from the top of a thunderstorm and arcing away from the main cloud and striking the ground. It is dangerous because it fools people into thinking the lightning danger is gone because the storm is not overhead. 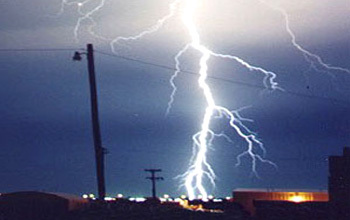 This type of lightning is a cloud-to-ground discharge. The discharge happens from the top most of the cloud to the ground. Hence the charges that pass to ground are positive. Thus it also known as positive lightning. It occurs during clear skies and it is considered harmful. 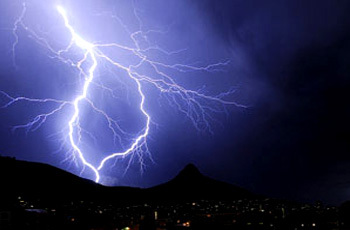 There are also rare types of lightning which could spark the extreme forest fires, eruptions of volcano, etc. 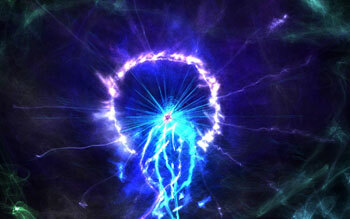 Scientists have observed a strange and extraordinary type of lightning, named as the Ball lightning. It occurs as a small charged sphere that floats, glows, and bounces off defying laws of gravity or physics. Ball Lightning Ball lightning is usually spherical in shape. Hissing noises originate from such balls and they sometimes make a loud noise when they explode. In general, some other types of lightening, include the most common types of lightening that never leave the clouds but travel between differently charged areas within the clouds or in between them. We can also have other types of rare ones which could spark the extreme forest fires, eruptions of volcano, etc. 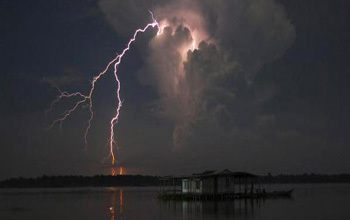 Scientists have observed another extraordinary type of lightning that is strange, this was named as the Ball lightning, which occurs as a small charged sphere that floats, glows, and bounces off defying laws of gravity or physics.